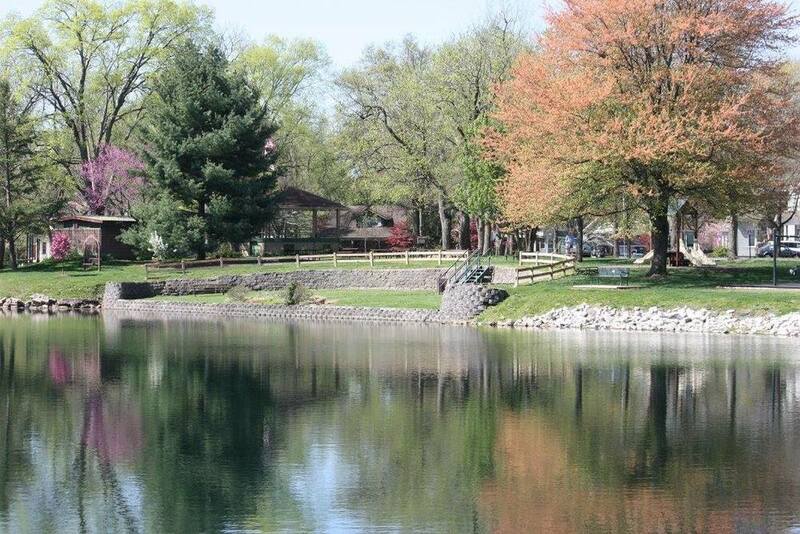 Leclaire Park is one of Edwardsville’s oldest and most beautiful parks. Consisting of only a little over five acres, the exact date when the lake and park were developed is still to be discovered. It does not appear on a plat map until 1910, but from newspaper accounts it can be determined that the lake was in existence by at least 1906. When first created, the lake served a dual purpose by providing a water source for the Nelson factories in addition to a recreational lake for Leclaire residents and visitors. The pump house at the northwest corner of the park is still there today. The water was pumped from the lake to the factory where it was turned to steam to run the equipment, then as the steam evaporated, the water was returned to the lake. The Leclaire factories and the village began using water from the Edwardsville Water Company in 1899, but this would have provided a cost savings. 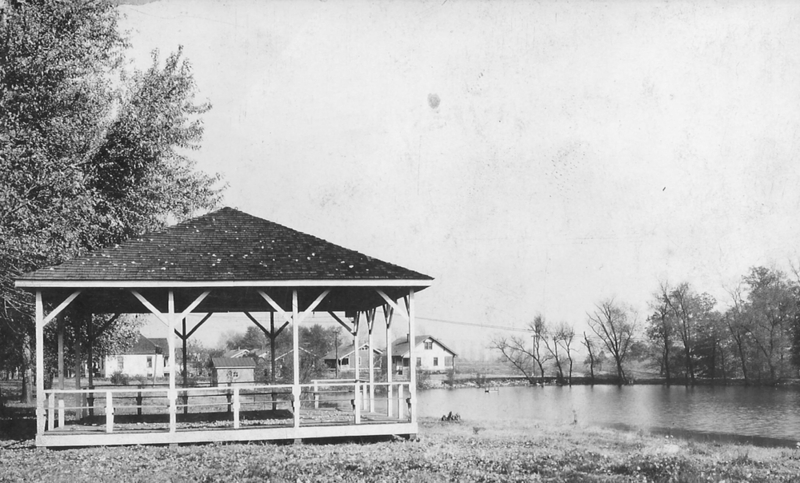 The grounds around the lake quickly developed with a pavilion for band concerts and boat houses to hold skiffs built in the Leclaire factories. Bath houses for changing clothes were built and there was a diving plank out across the water. The grounds were well groomed with trees for shade and numerous flower beds maintained by the company. Tom Trigg was in charge of the boat concession for the company. In addition, he and his wife began selling soda and renting bathing suits. On weekends people came from St. Louis, Missouri and other area towns for a day in the country. It was convenient to rent swimwear that could be left at the lake rather than dealing with a large wet “bathing costume.” Mrs. Trigg laundered them during the week so they were ready for the following weekend. The lake was regularly stocked and many fished from its shores or rented a skiff to go out farther in the lake. Mr. Trigg rigged Japanese lanterns on a wire above the boats so couples could row out into the lake for a romantic evening under the glow of the lanterns with the Leclaire Band providing background music from the pavilion. The lake offered swimming in summer and ice skating in winter. There were times in the early years when the newspaper reported as many as 150 people participating in these activities at one time. “Crack the whip” was a popular skating game where the skaters would form a line then try to skate fast enough and with turns “whip” the end of the tail off the line of skaters. There were a few drowning victims over the years, and many reports of rescued swimmers or children pulled from the lake when they broke through ice too thin to hold them. There were no life guards at the park so everyone swam or skated at their own risk. In the 1950s a system was established where a light would alert skaters to the condition of the ice. Located in the north window of the band-stand, the light is green when the ice is safe for skating and red when it is unsafe. Many area skaters remember how a bonfire was built on the beach in the 1960s and 1970s to warm skaters when they came in off the ice. The lake has undergone at least two full renovations, the first, during the Great Depression, was done by WPA workers. At that time the lake was drained and dredged to make it deeper. A sand “beach” was created and a wall built around the entire lake to help prevent erosion. The second complete dredging took place in 2006. Other changes have included gradually building up the grounds at the south end of the lake which at one time threatened the collapse of Lake Avenue. By filling in that area it also solved the problem of the low water levels on that end. 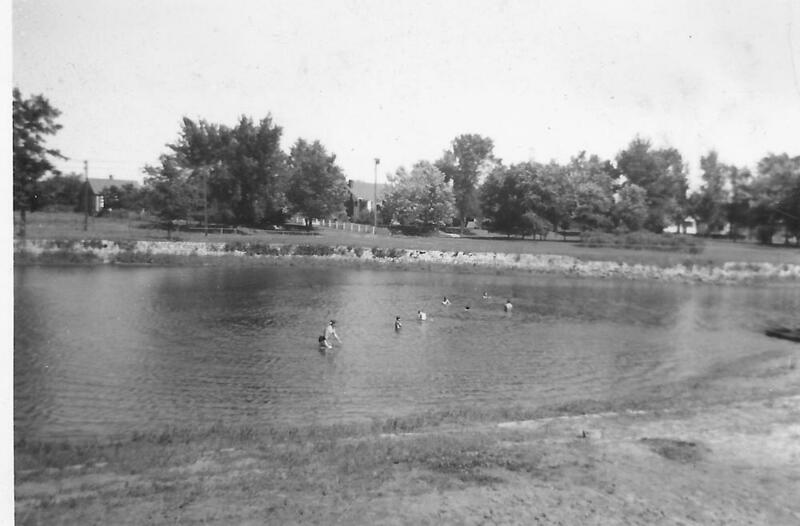 When Leclaire Lake Park was donated to the City of Edwardsville in 1934 (after Leclaire’s annexation) the city had a policy of not maintaining bodies of water. However, Leclaire Lake was a favorite place, not just for Leclaire residents, but for all of Edwardsville. Popular demand saved the lake from being filled in. But in the late 1940s it was determined that the water was not clean enough for swimming and with a sigh of relief, city officials banned swimming, although occasionally adventurous boys would take a midnight swim. The original band pavilion was of wood and at ground level. The current pavilion, built in 1924, was made with new restrooms/bathhouses under the platform. A major remodeling of the bandstand in 1957 replaced the wooden floor with concrete and created offices below the bandstand that were used for Civil Defense. The band stand was a Civil Defense shelter for many years and for about ten years in the mid-1970s-mid1980s it also housed the offices of Edwardsville Parks and Recreation. 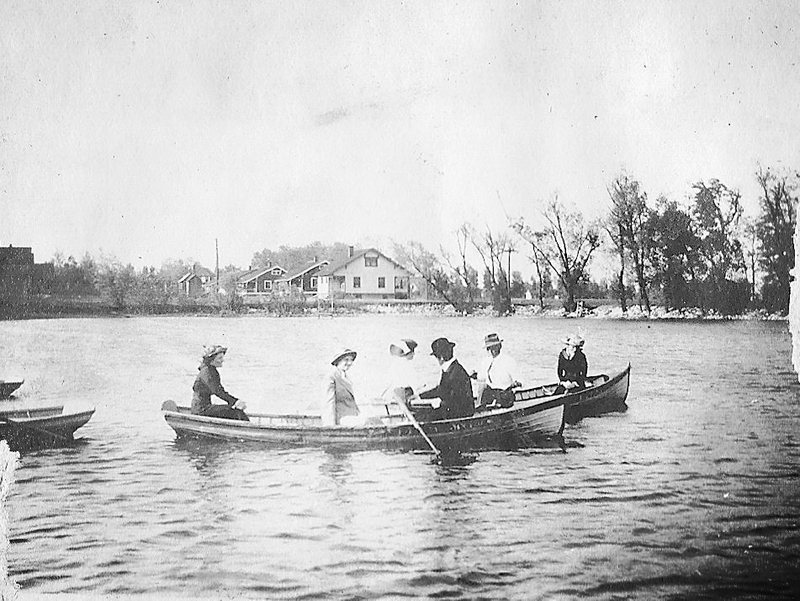 Boat concessions were discontinued when the city of Edwardsville took ownership. All of the old buildings along the shore, with one exception, are gone, which gives the lake a more natural appearance. In October 1996, the Leclaire Lake Fountain was formally dedicated. For Friends of Leclaire, it was a dream come true. The project began in February 1996 with the hope of raising money to help the Edwardsville Parks Department buy a fountain. The Bank of Edwardsville and the Edwardsville Intelligencer soon became involved. The Bank set up the FOL “Fountain Fund” account and the Intelligencer provided the advertisement. Through the generosity of many businesses, organizations, and individuals, $8,078.70 was donated. Many donors included notes with their fond memories of ice skating, fishing, swimming, boating, and picnicking at Leclaire Park. The fountain added to the serene setting of the park, as well as helped to aerate the lake. The fountain continues to remind us of the creative power of community cooperation. Today the park is more than just playgrounds and picnics. Yoga classes, fishing derbies, weddings, band concerts and an annual festival, Leclaire Parkfest, are all held at the park. And many visitors come in their best finery to take prom or wedding photographs with Leclaire Lake and fountain as a backdrop. The beautiful appearance of Leclaire Park today is thanks to the Edwardsville Parks and Recreation Department, but also to many individuals, businesses and civic minded groups that have stepped forward over the years to raise money and donate labor for the construction of gazebos, picnic shelters, sidewalks, a fountain, playground equipment and flower gardens. What visitors see at Leclaire Park today is the result of an inspiring collaborative effort made possible because area residents love Leclaire Park.